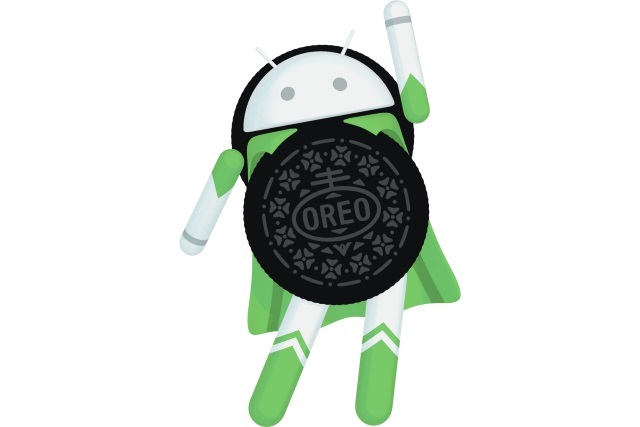 Finally much sweeter android 8.0 is out.Android 8.0 Oreo follows Android 7.1.2 Nougat, and it continues Google’s tradition of alphabetically naming its version updates after desserts.Every smartphone enthusiast will be eager to know the new features of Android 8.0 Oreo. Android 8.0 doesn't have much visible overhauls from it's predecessors.But there are plenty of new useful features.These small small changes make Android version 8.0 an update you don’t want to miss. Google claims that boot time of Android 8.0 Oreo OS is 2x faster than its predecessors.Get started on your favorite tasks more quickly when powering up. Account creation, login, and credit card transactions take time and are prone to errors. Users can easily get frustrated with apps that require these types of repetitive tasks.With your permission, Autofill remembers your logins to get you into your favorite apps at supersonic speed.Think of Google Chrome browser’s autofill option, where it stores your login information or address, and allows you to easily add it into forms. Smart Text Selection is also one of those features you won’t appreciate until you use it. We’ve all had to copy an address or phone number from one app, and then open the corresponding app such as Google Maps or your phone dialer to paste it in. Now with Smart Text Selection, when you highlight a phone number, for example, you’ll get the option to jump into the dialer app immediately. Android 8.0 allows activities to launch in picture-in-picture (PIP) mode. PIP is a special type of multi-window mode mostly used for video playback. Suppose you are watching your favourite YouTube videos and you want to text your friend without interrupting.This feature it lets you continue watching a YouTube video or a video call when you exit the app. The video now acts like a floating pop-up over the home screen or other app you’re using, allowing you to multitask. Biggest change in Android 8.0 Oreo that a user will experience is it's redesigned notification behavior and settings. Notification Dots:Press the notification dots to quickly see what's new, and easily clear them by swiping away. 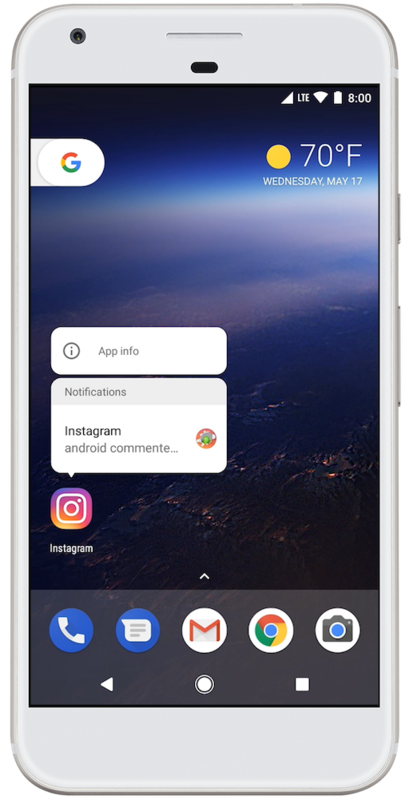 Notification channels: Android 8.0 introduces notification channels(notification categories) that allows user to customize each type of notification you want to display.This feature brings more control over what notifications you see. Press and hold a notification, and you can see a toggle to block all notifications from an app. Notification Snoozing: Users can snooze notifications, which causes them to disappear for a period of time before reappearing. Whether you're talking, playing, working or streaming, you can feel confident about keeping your battery strong and full of life.Features like Background Location Limits,Background Execution Limits etc.. make this possible. Background Location Limits:In an effort to reduce power consumption, Android 8.0 (API level 26) limits how frequently background apps can retrieve the user's current location. Apps can receive location updates only a few times each hour. Background execution limits:Whenever an app runs in the background, it consumes some of the device's limited resources, like RAM. This can result in an impaired user experience, especially if the user is using a resource-intensive app, such as playing a game or watching video. To improve the user experience, Android 8.0 Oreo imposes limitations on what apps can do while running in the background. Android 8.0 Oreo is packed with over 60 new emoji. Android 8.0 devices allows user to choose icon shape.A number of options like Square,Rounded Square,Squircle and Teardrop are there to choose from. Applications no longer need to bundle custom fonts, which helps reduce their size.Fonts can be downloaded and installed separately. Android 8.0 adds support for Wi-Fi Aware.On devices with the appropriate Wi-Fi Aware hardware, apps and nearby devices can discover and communicate over Wi-Fi without an Internet access point. Some apps, such as games, remote desktop, and virtualization clients, greatly benefit from getting control over the mouse pointer. Pointer capture is a new feature in Android 8.0 that provides such control by delivering all mouse events to a focused view in your app. Android8.0 comes with inbuilt printer support.Android Oreo devices will be compatible with all Mopria-certified printers, which make up 97% of printers sold worldwide. Android 7.0 Nougat’s release in August 2016, the version is only installed on 13.5 percent of Android devices. iOS 10, on the other hand, is installed on 86 percent of devices. When Google rolls out an update, chipmakers, manufacturers, and carriers all need to test it out to make sure nothing breaks, and this process can take months, if not more.Project Treble attempts to mitigate the issue by separating the Android code to make it easier for chipmakers like Qualcomm to find and make sure the software works with its processors. For explore more about new feature in Android 8.0 Oreo, visit official site of Android and android developer site . Don't forget to share 'What is new with Android 8.0 Oreo' with your friends.